Take control of the crawling and indexing process of your website by communicating your preferences to search engines. This helps them to understand what parts of your website to focus on, and what parts to ignore. There's a lot of methods to do this, so when to use which method? In this article we'll discuss when to use each methods, and we'll highlight the pros and cons. Search engines crawl billions of pages every day. But they index fewer pages than this, and they show even fewer pages in their results. You want your pages to be among them. So, how do you take control of this whole process and improve your rankings? To answer that question, first we need look at how the crawling and indexing process works. Then we’ll discuss all the methods you can put to work to control this process. Search engines’ crawlers are tasked with finding and crawling as many URLs as possible. They do this to see if there’s any new content out there. These URLs can be both new ones and URLs they already knew about. New URLs are found by crawling pages they already knew. After crawling, they pass on their results to the indexer. Pages that search engines are allowed to crawl are often called crawlable. Search engines can't rank what they can't crawl or haven't seen. That's why crawling and indexing are important topics. The indexers receive the contents of URLs from the crawlers. Indexers then try to make sense of this content by analyzing it (including the links, if any). The indexer processes canonicalized URLs and determines the authority of each URL. The indexer also determines whether they should index a page. Pages that search engines are allowed to index are often called indexable. After being crawled a page is forwarded to the indexers. Make sure your site is easily crawlable and crawl budget is not wasted. We know that Google has incredible crawling capacity, but especially on large eCommerce websites it really pays off to make sure Google's crawling and indexing the right pages. This improves relevance, conversion and ultimately revenue. Controlling indexation is about making sure your crawl budget is used for your 'money maker pages'. But there's more to it: it's about showing your users only your best content and products. Take control of the crawling and indexing process by making your preferences clear to search engines. By doing so, you help them understand what sections of your website are most important to you. In this chapter we’ll cover all the methods and which to use when. We’ve also put together a table to illustrate what they can and cannot do. Crawlable: are search engines able to crawl the URL? Indexable: are search engines encouraged to index the URL? Prevents duplicate content: does this method prevent duplicate content issues? Consolidates signals: are search engines encouraged to consolidate topical relevancy and URL authority signals, as defined by the URL’s content and links? Furthermore, it’s important to understand what crawl budget is. Crawl budget is the amount of time search engines’ crawlers spend on your website. You want them to spend it wisely, and you can give them instructions for that. For large websites it can be a delicate balance to manage a search engine's crawl effort to ensure all the right pages are crawled and indexed, while not blocking too many pages at the same time. Ideally a well thought-out site structure prevents a lot of long term crawl issues, but sometimes the sledgehammer approach of robots.txt blocking can do the trick. I also like using rel=nofollow on specific links I don't want search engines to crawl, such as faceted navigation. Crawling and indexing is the crux of technical SEO. It’s not something you need to worry about as much for smaller, basic websites. Google is fairly decent with that. But for larger, more complex websites, working to take control of crawling and indexing patterns becomes an essential part of SEO tasks, and can make all the difference. Search engines are OK-ish at figuring out what pages to crawl and index, but often it's recommended to communicate your preferences regarding the crawling and indexing process to them. Then they know what pages to focus on and which pages to ignore during crawling, which subsequently leads to more focus during indexing and less junk pages getting indexed. The robots.txt file is a central location that provides basic ground rules for crawlers. We call these ground rules directives. If you want to keep crawlers from crawling certain URLs, your robots.txt is the best way to do that. If crawlers aren’t allowed to crawl a URL and request its content, the indexer will never be able to analyse its content and links. This can prevent duplicate content, and it also means that the URL in question will never be able to rank. Also, search engines will not be able to consolidate topical relevance and authority signals when they don’t know what’s on the page. Those signals will therefore be lost. Often racking your brain what method to use when controlling search engines? Save time and pick the right methods! A site’s admin section is a good example of where you want to apply the robots.txt file to keep crawlers from accessing it. Let’s say the admin section resides on: https://www.example.com/admin/. Can't change your robots.txt file? Then apply the robots noindex directive to the /admin section. Robots.txt cannot resolve existing duplicate content issues. Search engines will not forget about a URL simply because they can’t access it. Adding a canonical URL or a meta robots noindex attribute to a URL that’s been blocked through robots.txt will not get it deindexed. Search engines will never know about your request for deindexing, because your robots.txt file is keeping them from finding out. The robots.txt file is an essential tool in optimizing crawl budget on your website. Using the robots.txt file, you can tell search engines not to crawl the parts of your website that are irrelevant for them. Keep search engines from crawling certain parts of your website, thereby preserving crawl budget. Keep search engines from indexing certain parts of your website – if there are no links to them. Prevent new duplicate content issues. Consolidate relevancy and authority signals. Remove content that’s already indexed*. * While Google supports the noindex directive and will remove URLs from its index, it's not recommended to use this method as it's an unofficial standard. It's only supported by Google and not 100% fool proof. Only use it when you can't use robots directives and canonical URLs. Want to read more about robots.txt? Check out the ultimate robots.txt reference guide. From experience, Googlebot can be very aggressive when crawling URLs if you leave it to figure things out on it's own. Anything that remotely looks like a URL in your source code can be crawled and I've seen them "try" URLs that don't appear to exist. For most sites, this probably isn't a big issue, but if your site is anything more than a few thousand URLs, you do need to think about controlling Googlebot and ensuring that they spend as much time as possible crawling the URLs that you care about. The robots directives instruct search engines on how to index pages, while keeping the page accessible for visitors. Often it’s used to instruct search engines not to index certain pages. When it comes to indexing, it’s a stronger signal than the canonical URL. Implementing robots directives is generally done by including it in the source using the meta robots tag. For other documents such as PDFs or images, it’s done through the X-Robots-Tag HTTP header. Say you have ten landing pages for Google AdWords traffic. You copied the content from other pages and then slightly adjusted it. You don’t want these landing pages to be indexed, because that would cause duplicate content issues, so you include the robots directive with the noindex attribute. The robots directives helps you prevent duplicate content, but it doesn’t attribute topical relevance and authority to another URL. That’s just lost. Besides instructing search engines not to index a page, the robots directives also discourages search engines from crawling the page. Some crawl budget is preserved because of this. Contrary to its name, the robots directives nofollow attribute will not influence crawling of a page that has the nofollow attribute. However, when the robots directives nofollow attribute is set search engine crawlers won't use links on this page to crawl other pages and subsequently won’t pass on authority to these other pages. Keep search engines from indexing certain parts of your website. Keep search engines from crawling certain parts of your website, preserving crawl budget. Consolidate most of the relevancy and authority signals. Want to read more about the robots directives? Check out the ultimate guide to meta robots tag. "Your content counts for nothing if Googlebot ignores key-sections of your website because it simply can’t understand the structure of your website." A canonical URL communicates the canonical version of a page to search engines, encouraging search engines to index the canonical version. The canonical URL can reference itself or other pages. If it’s useful for visitors to be able to access multiple versions of a page and you want search engines to treat them as one version, the canonical URL is the way to go. When one page references another page using the canonical URL, most of its topical relevance and authority is attributed to the target URL. Say you have an eCommerce website with a product in three categories. The product is accessible via three different URLs. This is fine for visitors, but search engines should only focus on crawling and indexing one URL. Choose one of categories as the primary one, and canonicalize the other two categories to it. Make sure to 301 redirect URLs that don’t serve a purpose for visitors anymore to the canonical version. This enables you to attribute all their topical relevance and authority to the canonical version. This also helps to get other websites to link to the canonical version. A canonical URL is a guideline, rather than a directive. Search engines can choose to ignore it. Applying a canonical URL will not preserve any crawl budget, as it doesn’t prevent search engines from crawling pages. It prevents them from being returned for search queries as they are consolidated to the canonical version of the URL. Want to read more about canonical URLs? Check out the ultimate canonical URL reference guide. The rel=“alternate” hreflang=“x” link attribute, or hreflang attribute for short, is used to communicate to search engines what language your content is in and what geographical region your content is meant for. If you’re using the same content or similar content to target multiple regions,hreflang is the way to go. It enables you to rank your pages in your intended markets. It helps prevent duplicate content, so having two pages with the exact same content for the United Kingdom and United States is fine when you've implementedhreflang. Duplicate content aside, the most important thing is to make sure your content rhymes with the audience. Make sure your audience feels at home, so having (somewhat) different text and visuals for the United Kingdom and United States is recommended. Within each market you want to rank with the right page. Here’s where hreflang comes in. Help search engines rank the right content in the right market. Want to read more about hreflang? Check out the ultimate hreflang reference guide. The rel=“prev” and rel=“next” link attributes, pagination attributes for short, are used to communicate the relationships among a series of pages to search engines. For series of similar pages, such as paginated blog archive pages or paginated product category pages, it’s highly advisable to use the pagination attributes. Search engines will understand that the pages are very similar, which will eliminate duplicate content issues. In most cases, search engines will not rank other pages than the first one in the paginated series. Want to read more about pagination attributes? Check out the ultimate pagination reference guide. The rel=“alternate” mobile attribute, or mobile attribute for short, communicates the relationship between a website’s desktop and mobile versions to search engines. It helps search engines show the right website for the right device and prevents duplicate content issues in the process. Want to read more about the mobile attribute? Check out the ultimate mobile attribute reference guide. If you’re unable to make changes (quickly) to your website, you can set up parameter handling in Google Search Console and Bing Webmaster Tools. Parameter handling defines how search engines should deal with URLs that contain a parameter. Using this, you can tell Google and Bing not to crawl and/or index certain URLs. In order to set up parameter handling, you need URLs that are identifiable by a pattern. Parameter handling should only be used in certain situations, for example sorting, filtering, translating, and saving session data. Keep in mind that configuring this for Google and Bing will not affect how other search engines crawl your website. Let you configure crawling and indexing for individual URLs. If you have confidential or private content that you don't want to appear in Google Search results, the simplest and most effective way to block private URLs from appearing is to store them in a password-protected directory on your site server. Googlebot and all other web crawlers are unable to access content in password-protected directories. Quickly choose the right method to address crawling and indexing issues! So how do search engine crawlers see your pages, and how do your pages render? Put yourself in their shoes by using their "Fetch and Render" tools. It's great for double checking whether URLs are responding as expected, but also to force push indexing the URL ("Request indexing"). Within seconds you can get a URL crawled and indexed. This doesn't mean its content is immediately processed and rankings are adjusted, but it does enable you to speed up the crawling and indexing process. Fetch the URL from which the new sections are linked, and choose to "Request index" with the option to "Crawl this URL and its direct links"
Fetch a URL as "Mobile: smartphone". Check whether 301-redirects are working correctly. Fill in a URL and check the header response. 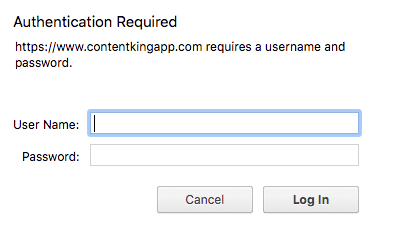 Situation 3 can more easily be done, in bulk within ContentKing. Google allows you to submit 500 URLs per month for Indexing. Google allows you to only submit 10 URLs per month for Indexing with all URLs linked from that URL getting crawled too. Bing has a similar tool, called "Fetch as Bingbot". Can I slow down crawlers when they’re crawling my website? How do I prevent search engines from crawling a website or page? What does indexing a website mean? Is my website indexable for search engines? How often does Google index my website? How long will it take Google to index my new website? How do I prevent search engines from indexing a website or page? 1. How often does Google crawl my website? Log on to Google Search Console and select a website. Head to “Crawl” > “Crawl Stats” and there you’ll find out how often Google crawls your website. If you’re fairly tech savvy, you can find out how often Google’s crawls your website by analyzing your website’s log files. It’s worth noting that Google determines how often they should crawl your website using the crawl budget for your website. 2. Can I slow down crawlers when they’re crawling my website? Yes, you can do this using the crawl-delay robots.txt directive. Google won't listen to it though. If you want Googlebot to crawl slower than you have to configure this in Google Search Console. Regardless of the method, it's not recommended to throttle Google and Bing's crawlers. Their crawlers are smart enough to know when your website is having a hard time, and they’ll check back later in that case. 3. How do I prevent search engines from crawling a website or page? Robots.txt: can be used to prevent the crawling of an entire website, sections, and individual pages. Parameter handling: can be used to prevent the crawling of URLs that contain a certain parameter. HTTP authentication: can be used to prevent the crawling of an entire website, sections, and individual pages. 4. What does indexing a website mean? It means actions are performed by a search engine to try to make sense of a website, in order to make it findable through their search engine. 5. Is my website indexable for search engines? The best way to answer this is to create an account with ContentKing to evaluate how indexable your website is for search engines. As you’ve been able to read above, there are many ways to influence how search engines index your website. 6. How often does Google index my website? As often as Google crawls your website. Its crawlers will pass on whatever they have found to the indexer, which takes care of indexing websites. 7. How long will it take Google to index my new website? There’s no single answer to this question, as it depends on the promotion of the new website. Promoting it speeds up the crawling and indexing process. If you do this well, a small website can be indexed with an hour. Alternatively, it can also take months to index an entirely new website. Please note that having your website indexed by search engines doesn’t mean your pages will start ranking high right off the bat. Achieving high rankings takes a lot more time. 8. How do I prevent search engines from indexing a website or page? Meta Robots noindex tag: is a very strong signal to search engines not to index a page. It doesn’t pass on relevance or authority signals to other pages. Canonical URL: is a moderately strong signal to search engines about what page to index, and to attribute relevance and authority signals too. HTTP authentication: will only prevent crawling and indexing of new pages from an SEO point of view. But it’s a still general best practice to use HTTP authentication on test environments to keep unwanted search engines and users out of it. Robots.txt: can only be used to prevent the crawling and indexing of new pages. Parameter handling: can be used to prevent the crawling and indexing of URLs containing a certain parameter. Take control of your crawling and indexing process with ContentKing!